Good Afternoon to All You Great Consumers of Content! Hooray for Fridays and all of the awesome things that come with it! As stated in last week’s blog, information overload is not only an epidemic spreading fast, but is something that we as 21st century citizens are actually getting used to. I tip my hat to you if you are able to shower, eat breakfast, and head off to work without checking your phone a single time. As soon as I’m up, I check for any missed texts or emails before racing off to the gym… not the healthiest of habits, but I’m sure many of you find interruptions throughout your day such as texts, emails, and the phone ringing off the hook just as distracting. Prioritize your time – I simply refuse to take my phone to the gym or along with me during any sort of exercise. That is my time to get away from the world and its chaos, and provides me the time to collect my thoughts and regroup. Think of all the distractions that you come face to face with everyday. Without an outlet, we will quickly become overloaded and stressed. 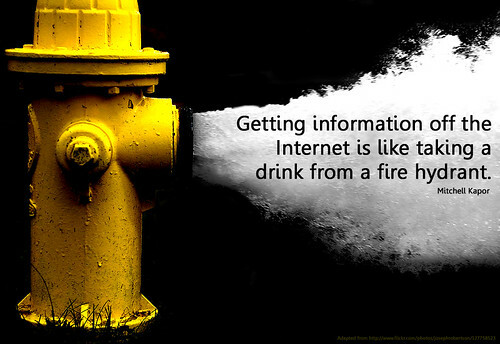 Filter your information – I certainly don’t need to tell you how much digital garbage is floating around out there. Cable TV, Twitter feeds, blogs, text messages, emails, it’s almost overwhelming just to think about! Make sure you not only set a time limit when you go out to gather news and information, but also filter out the junk from the good stuff. Go to highly reputable sites, ask for other reader’s opinions, and don’t spend your valuable time on time wasters. There is tons and tons of very legit and remarkable content out there, you just need to find it. Share your great content – 75% of the awesome articles and blogs I read come from other readers that have shared great content with me before! The purpose of social media is to build a powerful network, of similarly minded people, that helps you access resources you find helpful so that you can share it with others. What is your favorite source for news and information? Previous Apparently, There’s an App for That! You’ve inspired me. I’m setting up my blog as I type. More later as we share philosophies. Where do you get all those phabulous photos for your blog? Wasting time is definitely a waste of time! We’re only given so much to be productive with and are especially about using it. Glad to hear you’re setting up a blog!